There may not be any optimal time to tell gamers about all the microtransactions and DLC for which they can expect to pay extra in an upcoming release. But the official reveal of a game's main features - the stuff folks expect to come with the $59.99 retail price - would probably be the least optimal. 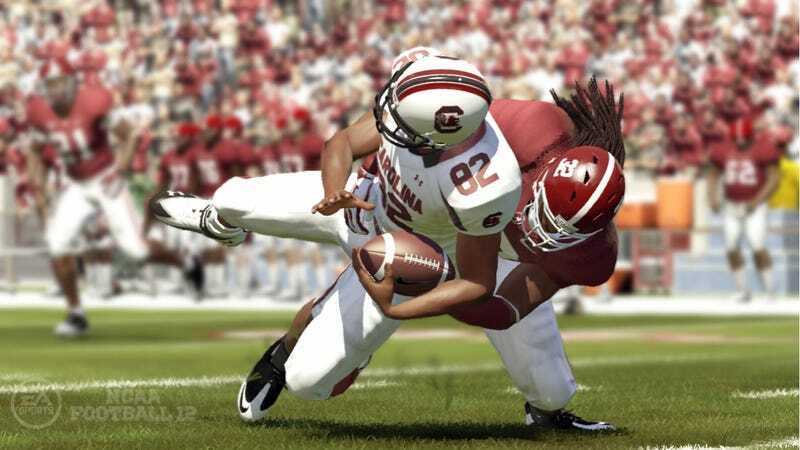 In NCAA Football 12's promo blitz on Monday for the game's "Dynasty" and "Road to Glory" upgrades, fans of the series learned that two highly anticipated features in the game's package of web-enabled offerings will carry one-time, $3 charges each. Even for a publisher with a huge portfolio of paid DLC and microtransaction content, this type of pay-for-play caught many off guard. Access to that convenience will cost 240 Microsoft Points, or $2.99. Also this year, Online Dynasty participants will be able to use the game's Super Sim feature on the website, including the full playbook and play-by-play controls found in the console game. That too is $2.99/240 MSP. "It was a big technical challenge," NCAA 12 producer Ben Haumiller told me during a telephone preview of the new features, especially Super Sim on the Web. "We had to get our simulation engine up on the server so it could simulate all the CPU vs. CPU games that need to happen. It was a big technical hurdle; it's not as easy as just moving the week along." But nothing in the buzz leading up to their reveal suggested they or any other improvements to Online Dynasty would carry an additional charge. And what doesn't sit well with me and others is the fact these were community requested features, especially advancing weeks from the web. Few things fire up a community like a developer taking its suggestions seriously and bringing them to a game. To turn around and charge for that sends a pretty bad message. Furthermore, to this point EA Sports' other microtransaction content is content for use in gameplay. In NCAA, like Madden or NHL, these are typically cheats or boosts, things purely optional and nothing anyone's clamoring for on the message boards in great numbers. Playing games in the Super Sim mode from the Web is a breakthrough, and the decision to charge for it is more defensible. But slapping a $3 charge to enable the advance-week option over the web is charging users to access an administrative feature. I've never heard of anything like that before. EA Sports has no shortage of critics from outside its games' communities. Inside NCAA's there's been some grumbling but not any signs this is a huge rupture. The pre-release enthusiasm for NCAA 12 has been remarkably positive, and the game's major new features and modes are all included with the retail cost. "Coaching Carousel" has been requested for a long time, and it's basically a second career mode, starring you as a coach. "Road to Glory" now gives you a full high school season for your created football player, with some unbelievable customization options through the web interface. That's free too.